Oscilloscopes and logic analyzers are indispensable lab tools used in virtually every engineering lab to measure electronic signals. An instrument of choice of electronic engineers, oscilloscopes are an indispensable tool that shows voltage against time waveforms to observe time-varying input signals. They are used to measure and view analog electronic signals. On the other hand, we have logic analyzer which is also a test instrument used for measuring and viewing electronic signals, but instead of analog signals, they deal with complex digital electronic signals. Both test instrument have coexisted for years and are still offered by major measurement and test instrument vendors. While some regard oscilloscopes as narrow-channel logic analyzers, the difference between the two is quite subtle. An oscilloscope is a piece of test instrument used as a measuring tool for analog electronic circuits. It is specifically designed to display the variations in the voltage, periodic or otherwise, that are met within electronic circuits. It observes the varying-signal voltages plotted in a two-dimensional grid representing time. It measures and represents the analog aspects of a signal that is its voltage and how the voltage changes over time. Instead of recording data continually, it captures a snapshot of the corresponding waveform and display it in real-time. The oldest form of oscilloscopes, “cathode-ray oscilloscope” is still used in some labs. However, the modern oscilloscopes are more sophisticated and employ computers to display waveforms. Logic analyzer is a specialized test instrument used to measure and analyze multiple digital electronic signals simultaneously and display signals as timing waveforms or logic state listings. They function as a data interpreter by capturing and displaying logic signals in a variety of forms. It interprets the contents of the digital signal using a protocol analyzer depending on the format of the communication being used. It provides a convenient means of viewing the state of a logic signal allowing multiple channels to be measured simultaneously. It also stores the state of the logic inputs in memory so the complete record can be displayed. An oscilloscope, informally called as Cathode-Ray Oscilloscope, is an electronic test instrument used to measure, view, and analyze varying electronic signals, usually on a two-dimensional grid as a function of time. It observes the change of analog signals over time when connected to a power source through a probe and displays the corresponding waveform in real-time. Logic analyzer, on the other hand, is a test instrument used to view and analyze digital electronic signals. Like an oscilloscope, it’s also used to view and observe multiple waveforms, except it can only be used for digital signals. An oscilloscope can be simply used as a scope for basic timing issues and can perform most of the functions of a logic analyzer. However, a logic analyzer is better suited to operating in a digital environment for tracking down functional and timing problems. The primary value of an oscilloscope is the scope, but a logic analyzer specializes in digital channels. In fact, it captures and displays a sequence of digital events by providing multiple channels of data as well as long data display times which becomes a problem in case of oscilloscopes. While both test instruments use a similar form of display to analyze waveforms, they are fundamentally different when it comes to operating principle. Oscilloscopes can work across both single-shot applications based on trigger setting as well as to observe and investigate repetitive waveforms. 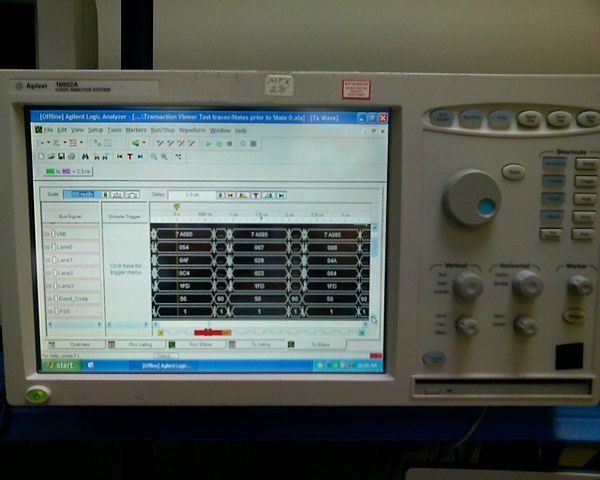 Logic analyzers, on the other hand, are typical test instrument used mostly for single-shot applications. An oscilloscope generally feature two or four input channels, whereas logic analyzers feature multiple input channels ranging from 34 to hundreds or even thousands. However, they do not display any analog information. They also differ in the way they acquire and display signals. The primary function of an oscilloscope is to provide a graph of an input signal’s voltage over time. It precisely uses asynchronous sampling to acquire signals using an 8-bit analog-to-digital converter (ADC) to digitize the input signal. The ADC then sends the digitized signals to a processing block and on-board memory to generate the entire analog information and put it on display. Logic analyzers, on the other hand, offer more extensive acquisition modes and interpret the contents of the input signal using a protocol analyzer depending on the format of the communication. Oscilloscopes have two common modes of triggering, auto and normal. Triggering is used both to capture unique signal events and stabilize the display even with complex repetitive signals. The trigger point not only allows you to stabilize recurring waveform but also to capture single-shot waveform. The normal mode displays a waveform only when the input signal reaches the set trigger point, where in auto mode, the oscilloscope sweeps even without a trigger. Unlike oscilloscopes, logic analyzers incorporate sequential triggering. The logic analyzer triggers are often simple, but they require complex programming. Both oscilloscopes and logic analyzers are the most common test instruments used for testing complex electronic circuits and over the years, become the tool of choice for engineers around the world. Oscilloscopes have become widely popular over the last decades. They have become the best tools for testing analog electronic signals and for evaluating signal integrity. Logic analyzers are no different than oscilloscopes in terms of operation, except logic analyzers are ideal for analyzing digital electronic signals. They also differ in the way they acquire input signals and triggering. While they both display waveforms, they are fundamentally very different in how they operate. Sagar Khillar. 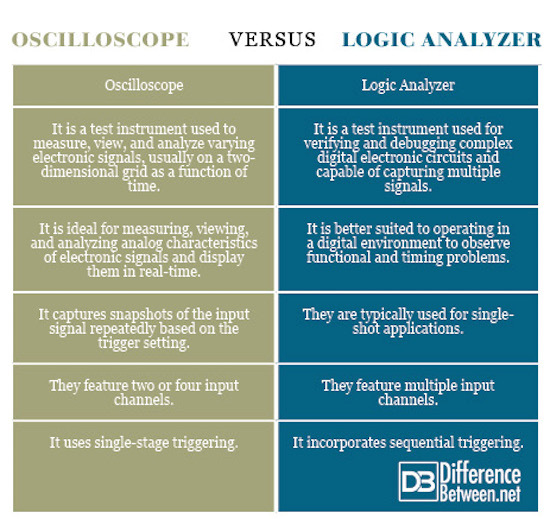 "Difference Between Oscilloscope and Logic Analyzer." DifferenceBetween.net. July 17, 2018 < http://www.differencebetween.net/technology/difference-between-oscilloscope-and-logic-analyzer/ >.